This gold pendant has a geometric design that is very appealing, even more so once you recognize the three letters within the pattern. The Classic Monogram Pendant in 14K Gold can hold up to three initials of your choice, placed in a round design that hangs easily as part of a necklace. 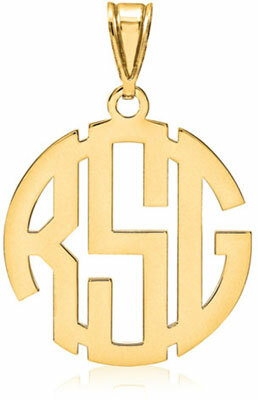 The monogram measures 25mm by 25mm (not including bale) and features 14k yellow gold. The design is formed by using three letters in a circular fashion to create a truly unique monogram. It even includes stylistic cut-outs in the gold to accent the shape of the letters. It is a flat pendant that fits nicely and comfortably against the skin when paired with a gold chain. The gold is polished to a high finish, reflecting light and shadow.